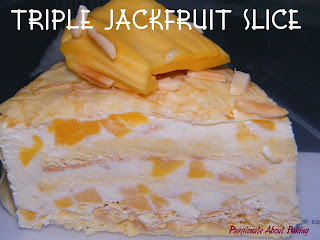 The reason it was called Triple Jackfruit cake was because jackfruit was used in the sponge cake, the mousse and a layer of crispy bites. Cool, isn't it? I tell you, while she was preparing the jackfruit, the scent of jackfruit filled the kitchen. Even though the number of steps and ingredients involved were really numerous, the taste of the cake really made the efforts worthwhile. The cake was heavenly! 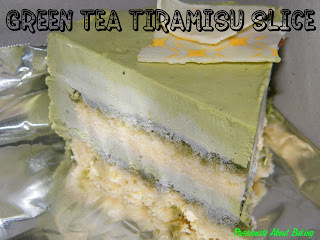 The second cake demonstrated was the Green Tea Tiramisu cake. 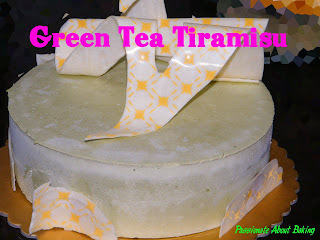 Green tea liquor was used. That was really cool too! The green tea colour was very natural. I like the overall colour. The mousse was very smooth, almost like having an ice-cream. 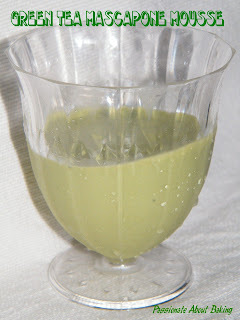 I was given a cup of the left-over green tea mousse and I didn't have the chance to finish it, my son wobbled them down before I could take another spoonful! 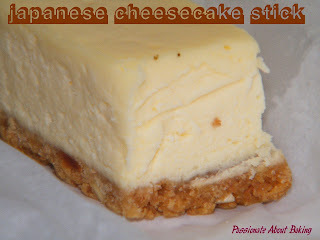 Finally, the last of the cake was Japanese Cheesecake Stick. It was almost like our normal cheesecake. 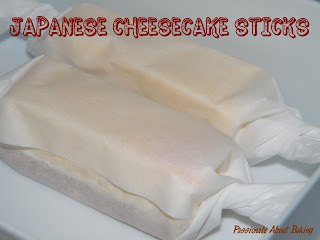 However, this type of cheesecake allows you to cut them up into rectangles and wrapped them up individually! I was telling Doris that I would like to try to bake this, then sell them! Looks pretty easy to wrap them up and sell. If I'm not wrong, the USP is around $2.80/pc. Good? Ah...one more good thing about Amy is, Doris pestered her to prepare salad for us. Doris and I had been a great fan of all Amy's salads. We simply love them! So Amy obliged. 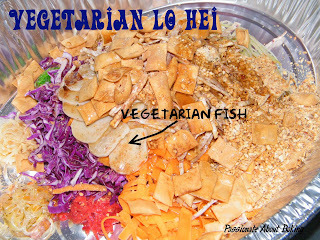 Since it was "Yuan Siao Jie", she made vegetarian "Yu Sheng" for us. Isn't she fantastic? She made the sauce herself. We bugged her for the sauce recipe but she has yet to give us. It was very nice. I took a lot of servings. I've attended so many workshops from her, but so far, I've only baked the Chocolate Praline Cake. I must try to bake them, otherwise, in time to come, I'll definitely forget the steps and the know-how! 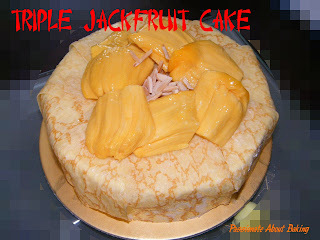 Wow, interesting "Triple Jackfruit Cake"!! Never try a jackfruit cake before, bet this is very delicious..:) This is so special, and jackfruit is one of my favourite fruit. Nice! Wow..innovative and intresting cake..looks yummy and delicious..
very intriguing! I agree wth u about the green tea colour. its beautiful!! Yes, it was really good. And the jackfruit wasn't too over-powering too! It's quite an indulgence isn't it? Hopefully I can make it the next time round!! You've not been baking lately? I've sent you an email separately. You're very good arh, you know it's a good workshop when you see one! ;) Hope you'll have fun too! Thanks for your info. Any idea how big were the ones you saw? I think the ones we received was about 1.5" 1.5" x 4". You think it should be smaller? :P I've not tried it for a long time, so I cannot recall what is the size outside. Hi Jane, I am so impressed by all the cakes! They all look beautiful in their own right. 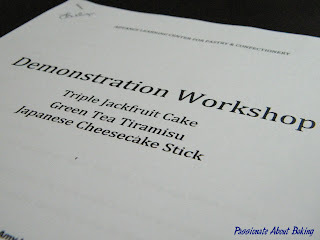 You are really Passionate About Baking, taking the time to attend workshops to improve yourself. What an inspiration! HI! i would like to make that jackfruit cake but how can i learn ? Amy is now teaching at Kitchen Capers and Shermay. You may want to check her out thru those sites. Hope this helps.